A 6-year-old dog attack survivor is collecting gifts to take to young patients at Kennedy Krieger Institute in Baltimore, where she's been getting treatment. About a year ago, Kat Parsons was fighting for her life after a vicious, unprovoked dog attack left her with deep bites, a fractured skull, a paralyzed arm and serious nerve damage. WASHINGTON — About a year ago, an Anne Arundel County girl was fighting for her life after a vicious, unprovoked dog attack left her with deep bites, a fractured skull, a paralyzed arm and serious nerve damage. Now, Katarina Parsons wants to help other kids who are battling serious health problems. The attack happened the day before her sixth birthday at a family friend’s home in Chesapeake, Virginia. She was bitten and dragged by two Belgian Malinois. “Katarina shouldn’t even be alive,” said her mother, Sandy Parsons, who calls her Kat. 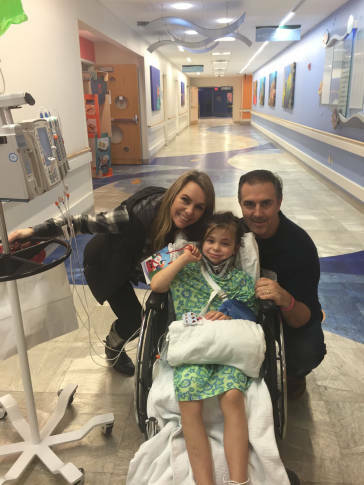 The young girl from Riva, Maryland, has endured numerous surgeries, including a 10-hour nerve transplant in April. “She had to learn to hold her head up again, to sit up, stand up, walk,” Parsons said. Last year, Kat received birthday and Christmas gifts while in the hospital. “So this year, for her birthday, she asked if she could donate her gifts to the kids in the hospital,” her mom said. Kat is collecting gifts to take to young patients at Kennedy Krieger Institute in Baltimore, where she’s been getting treatment. She plans to visit on her birthday, Dec. 14. People can donate money that will go directly toward Kat’s gift drive online, set up by Kennedy Krieger. Kat faces a four-year recovery and regularly endures painful physical and occupational therapy sessions. One reason is to keep her paralyzed arm moving. After the attack, Kat initially had to be home-schooled, but she returned to a classroom this school year. She’s also enjoying dance classes.